ISLAMABAD, Aug 2 (APP): President Mamnoon Hussain Tuesday said that volume of bilateral trade between Pakistan and Romania was below the potential and called for further increasing it to the mutual benefit. The President said Pakistan considered Romania an important country bilaterally as well as in the context of the European Union. He said there was a need to exchange high level delegations between the two countries for furthering bilateral partnership. The President was talking to the outgoing ambassador of Romania Emilian Ion who called on him at the Aiwan-e-Sadr, said a press release. The President said that bilateral relations between Pakistan and Romania were based on mutual goodwill and both countries shared views on many important global issues. He also appreciated the efforts of outgoing ambassador for promoting and enhancing Pakistan-Romania bilateral ties. Outgoing ambassador of Romania thanked the government of Pakistan for cooperation during his stay in Pakistan. 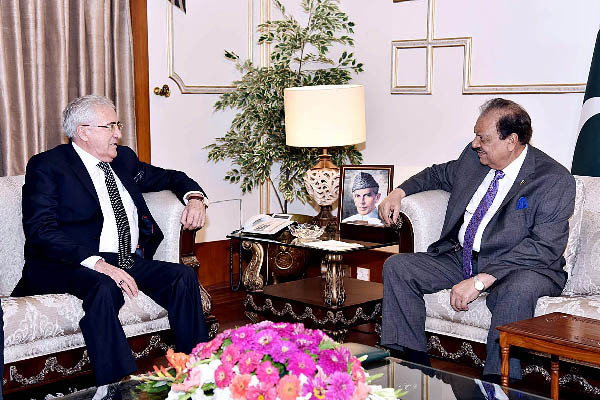 President Mamnoon Hussain hoped that the outgoing ambassador after return to his country would continue to work in the same spirit for further improving relations between Pakistan and Romania.